We, at DRY-MAX, feel that our compound is better than the compound you are currently using. And because you buy it directly from the manufacturer, we can offer you a superior product at a discounted price. 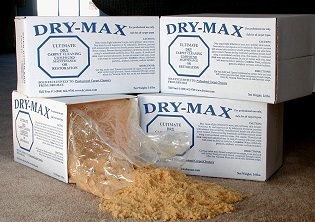 DRY-MAX Compound is available in cases of four 14 pound boxes that are easily resealable. You will easily see how much of a savings this can mean to you! Please try our product today and let us know how you like it. We look forward to hearing from you and doing business with you. Please call, email or write us with your order. FREE SAMPLE of DRY-MAX is available upon request from carpet cleaning companies. DRY-MAX is a compound designed for Dry Extraction Carpet Cleaning. 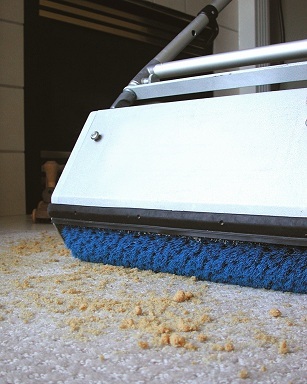 Dry carpet cleaning is used by commercial facilities, as well as private homes all over the world. The Dry-Max dry carpet compound is environmentally friendly and can be used to improve indoor air quality. Carpets act as filters in your home and business, trapping soil, allergens and other indoor air pollutants. Proper cleaning of your carpets can drastically improve indoor air quality. Dry cleaning carpet with the dry extraction method is extremely beneficial. Dry carpet cleaning is a catch phrase for many types of cleaning: dry foaming, dry bonnet cleaning, crystallizing liquid and dry extraction carpet cleaning. The main reason that spots come back after the cleaning is over, is from wicking. This is caused from over wetting the spot when cleaning. When you use a liquid to remove a spot some of the liquid is lost in the process. The lost liquid ends up in the carpet base and backing. As the carpet dries, the spot gets lifted up the fibers of the carpet in the same way a wick works on a candle or lantern. Dry-Max is the ultimate dry carpet cleaning compound. We are also known as DryMax, Drymax, Dry-Max, DRYMAX and DRY-MAX. You can call us whatever you want. Just don't call the carpets -- cleaned with our dry compound -- dirty!